So, I’ve been doing this for six years now. This year May was one for the weather books – we nearly didn’t (couldn’t) bbq outside. In the last week we’ve had flooding, tornadoes, and damage all around us. But today, the Sunday before Memorial Day, it was partly sunny and 90 degrees. It’s time to bbq ribs. 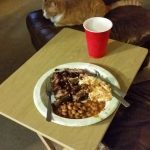 We had the usual suspects – with a twist: this year it’s baby back ribs, my variation of Memphis Dust rub, Barbie’s potato salad, beans, and a dessert. Barbie’s potato salad was delicious! I didn’t try the dessert she made, but by the “yumm” and “this is good” comments I gathered it was delicious too. The ribs were good, but it took a while to repair them. First off, they were the largest baby back ribs I’ve ever seen (3.7 lbs and 3.8 lbs). Second, I had the oven at 250 the whole time. I started cooking them at 12:30 PM, wrapped up without the rub in an aluminum pan; I brined them but forgot to rub them. I uncovered them at 2:30 and added rub. I covered them again at 3:30. I uncovered them at 4:30 and covered them again at 5:00. I left them covered until 7:00, when they finally showed signs of tenderness. I left them open while I started the grill. I put them in the grill from 7:30 to 8:00. We finally ate around 8:30. That was a long day of tending to ribs. I think where I went wrong was the double cover of aluminum: foil in a pan. I think last year I put them on a baking sheet. Also, I thought last year I started with uncovered for 2 hours, then sauce, then covered for 2 hours. 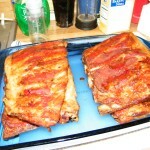 Also, I think these ribs were closer to St. Louis cut then baby back size. Ladies and gentlemen it’s that time once again when we strive for tender ribs, tasty sides, and family time – it’s Memorial Day weekend 2014. 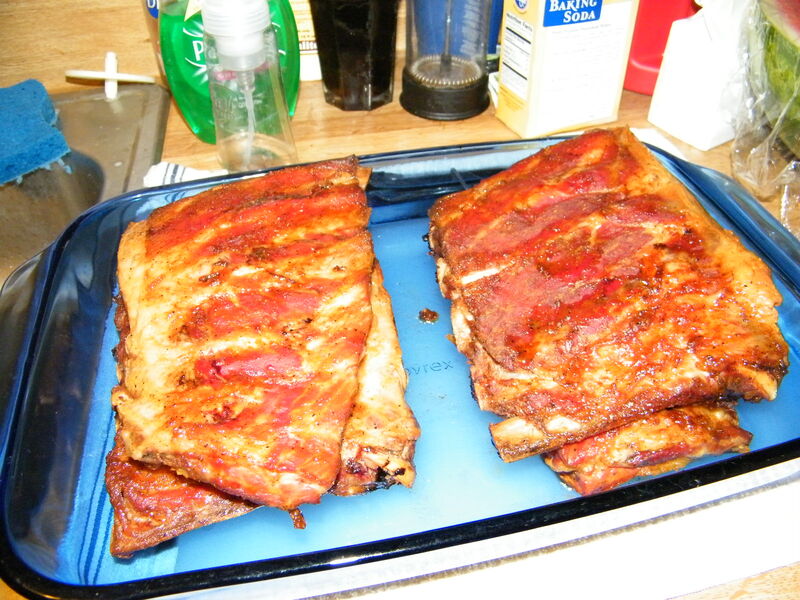 Last year – you’ll recall – I smoked the ribs on the grill for 1 hour then oven-baked them for 3-4 hours. This year I’m going to reverse that process: oven bake first then finish up on the grill. Well, I delayed getting the ribs a little too long this year, and Kroger (our local grocery store) put spare ribs on sale on the Wednesday before Memorial Day (Monday). Needless to say they were sold out by Friday. All I had to pick from was plastic-wrapped, marinated St. Louis cut spare ribs (Chipotle or Kansas City flavored); I work with what I got. This will be different. I’m starting off with two slabs of marinated ribs. What is Kansas City flavor? Remove the membrane. 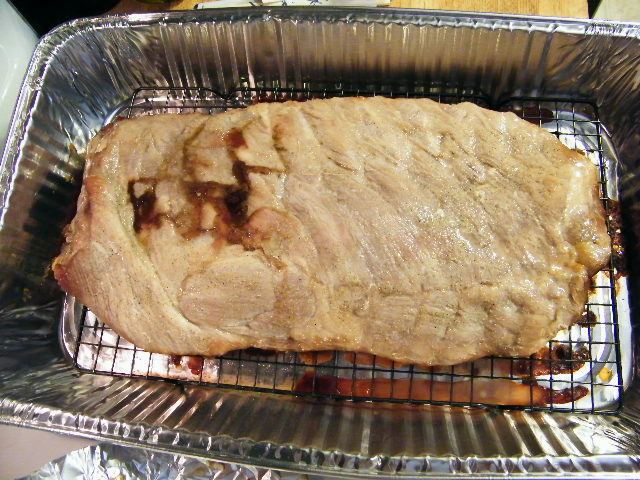 Put the rubbed (or marinated) ribs, uncovered, bones down, in an aluminum-lined baking pan. I use a disposable aluminum pan. Bake at 250 F for 2 hours. 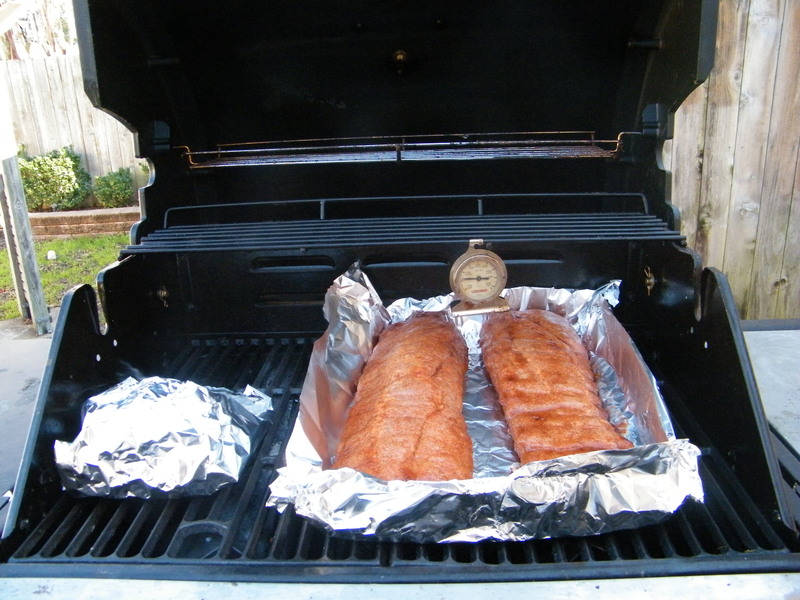 Ribs for Memorial Day 2014 – 2 hour mark. Left one is coated with barbecue sauce. Right one awaits. After 2 hours, pour off any fat/juice from the pan. 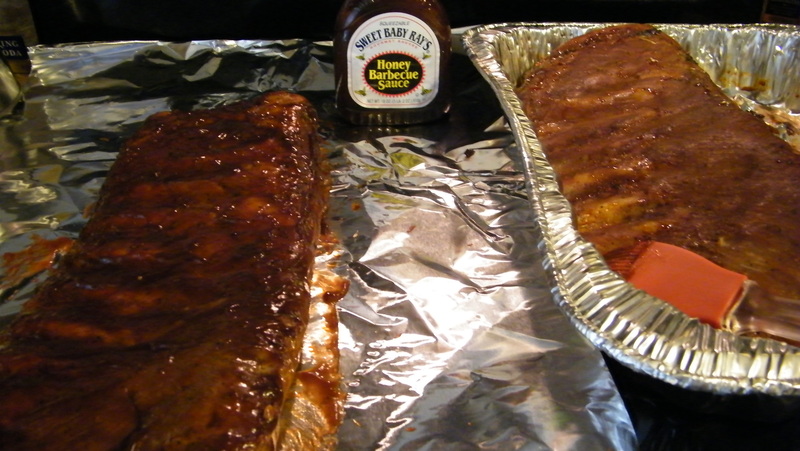 Brush ribs liberally with your favorite barbecue sauce. 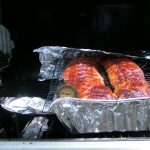 Wrap (or cover them tightly) the ribs in heavy-duty aluminum foil. Bake at 250 F for another 2 hours. This time after 2 hours, check if the meat pulls away from the bone. If not, wrap them up and continue baking – check every 15 minutes – until you can pull on the bones and they start to slide out. Don’t exceed 1 hour on this step. When they’re tender pull them out of the oven. 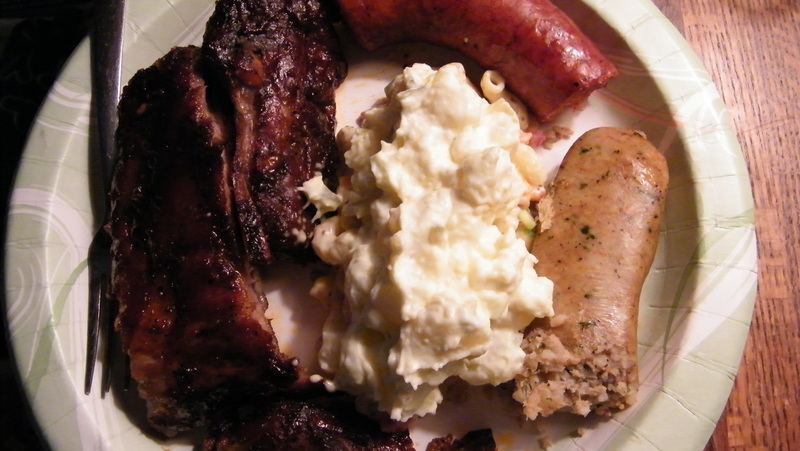 Ribs for Memorial Day 2014 – plate with ribs, potato salad, macaroni salad, andouille and boudin. Everything (except gramma’s beans) turned out great. Ribs were good and tender. 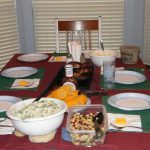 The macaroni salad and potato salad were tasty. I cooked regular sausage, boudin, and andouille to go with the ribs; they were OK. We’ll try the beans again tomorrow. I like the recipe Oven Baked Ribs Spare Ribs from TheMeatSource.com, but I’m going to add a twist: smoke in grill first, then finish in oven. Step 1: Wash the ribs and remove the membrane from the bone-side. If you didn’t buy St. Louis style ribs, cut off “the skirt” (a small piece of meat on one side that sticks out) so that the rack of ribs look more rectangular. Sprinkle both sides of the ribs with your rib rub. 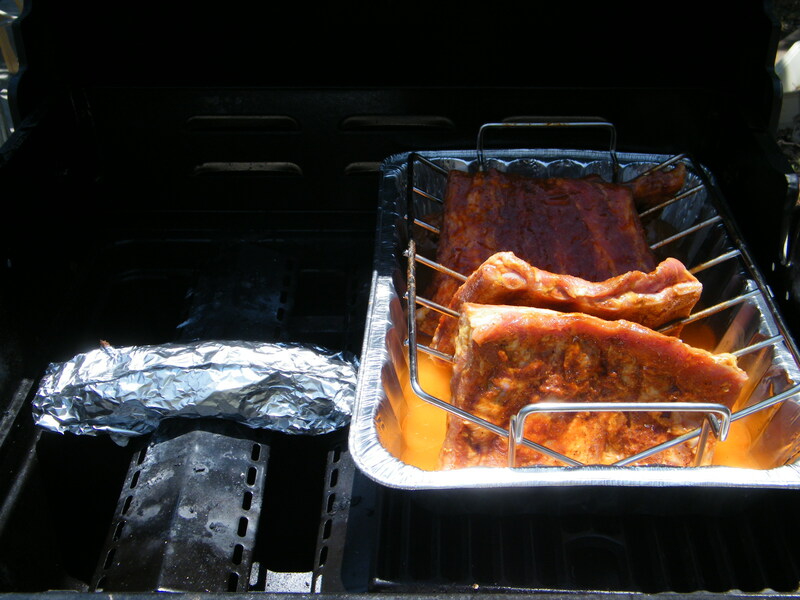 Place the ribs in the baking pan, bone-side down, and cover the pan with plastic wrap or foil to keep the bugs out. Let them sit at room temperature for 1 hour. Step 2: Now for the twist: smoke them outside in the grill. Add your favorite wood chips in the grill and stabilize the temperature between 225 and 250 Fahrenheit. 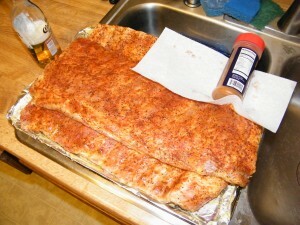 Place the ribs in a rib-stand and place the stand on the side away from the heat – i.e. the indirect heat method. 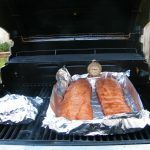 Keep an eye on the temperature and smoke them for 1 hour. Step 3: Pre-heat your oven to 300 Fahrenheit. 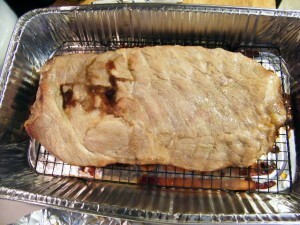 Place the ribs in to the baking pan and seal the pan tightly with aluminum foil. (I actually put some sauce on them before I sealed them in the pan.) Place the baking pan in the center of the oven. Bake ribs for 1 hour. Step 4: Remove the foil from the pan, and drain any fat from the pan. 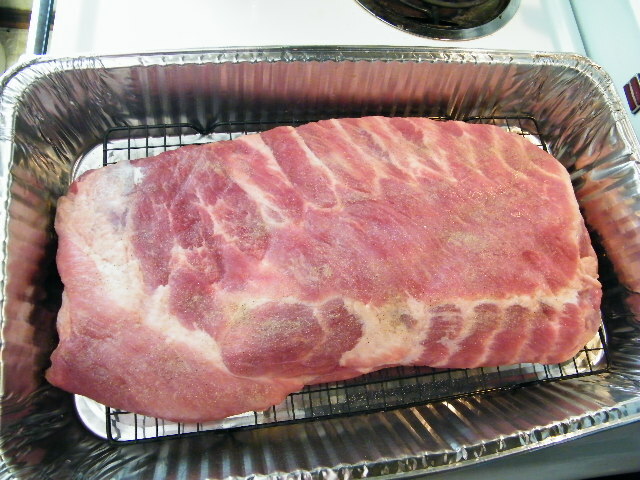 Place ribs back in the baking pan, bone-side down. Leave the foil off. Bake ribs for 1 hour. Step 6: Turn off the oven. 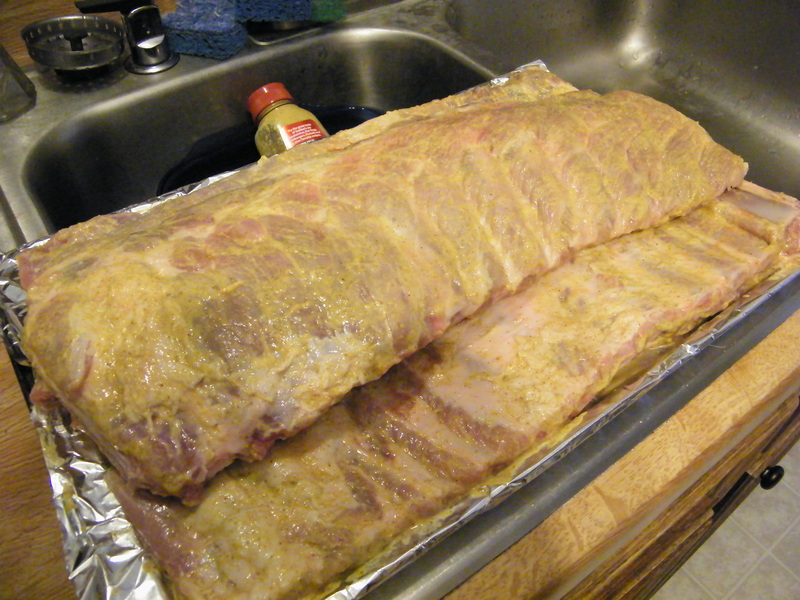 Remove the pan from the oven, and wrap the rack of ribs in foil. 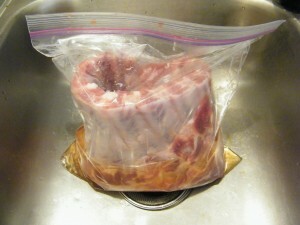 Place the ribs in a paper bag, and fold the top of the bag tightly closed. Let the bag of ribs sit at room temperature for 1 hour. You are now a BBQ God! …so on the seventh hour, he rested, and enjoyed the fall-off-the-bone spare ribs. Amen. I have a 3-burner gas grill and even 1 burner on low is too hot, so I bought an aluminum charcoal lighting box and put about 20 briquettes in it. It produced a lower, stable temperature. I could have kept feeding it briquettes, but I didn’t want to watch the temperature all day on my inaccurate thermometer. I know I said last year I was done with ribs. I know I should have read my blogs again to remind myself that me and ribs are not meant to be, but time heals all wounds and how quickly we forget. This year I used a different technique hoping a avoid last year’s failure. I bought 3 racks of St. Louis style ribs from Kroger’s. In hind sight I think I could have gotten away with 2 racks. We had baked beans, salad, and corn on the cob; never made it to the watermelon. Maybe we’ll turn the left overs into pulled pork via the slow cooker. 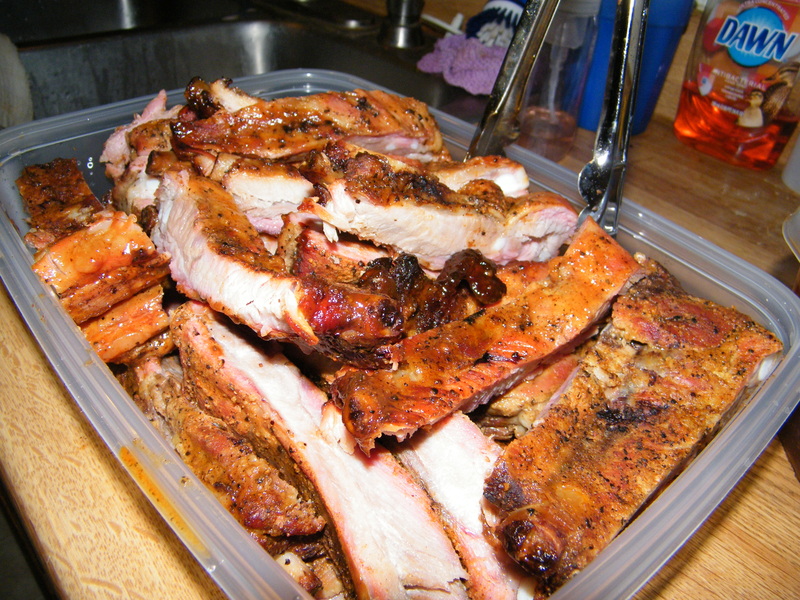 First, marinate the ribs in apple juice for 2 hours. Next, I coated both sides in Gulden’s spicy brown mustard. 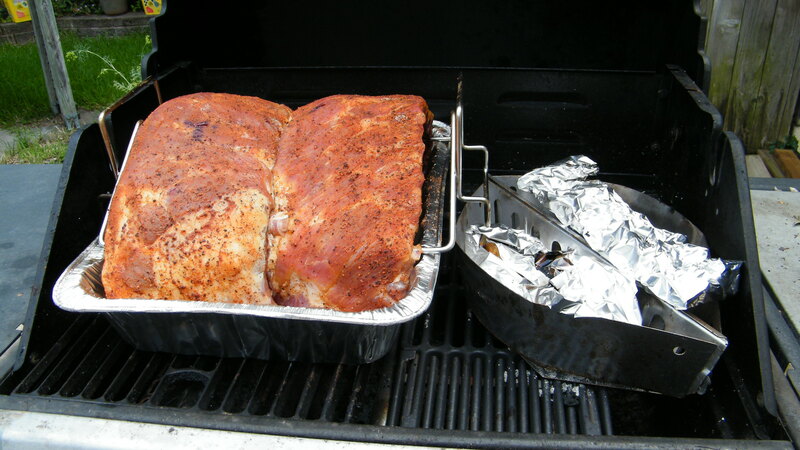 Next, I coated both sides in Nolan Ryan’s BBQ rub. It was spicy, but not too spicy. 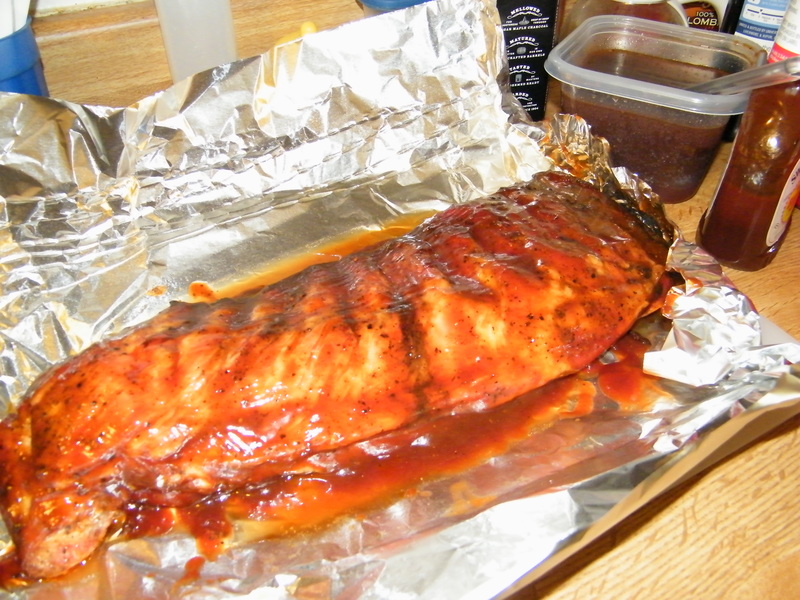 Next, I bathed the ribs in sauce and wrapped them in aluminum foil. They went back on the grill for another 2 hours. Cut up the ribs and enjoy. But seriously, temperature is the number one factor to effect tenderness. I think I need a good thermometer and I need to stabilize the temperature. 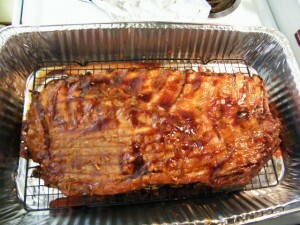 My wife wanted to try this recipe for oven baked spare ribs. Her recipe – or specifically her mom’s recipe – is very simple. 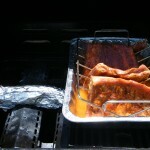 Start with ribs on a rack in a pan, and lay tin foil on top of the meat so it doesn’t burn (don’t wrap). Cook at 350° F for 4 hours. Take the tin foil off, flip over (bones up), and bast with barbecue sauce. Cook for another 30 minutes. Turn over (meat up) bast with barbecue sauce. Cook for another 30 minutes. Repeat the turning process until ribs are tender. 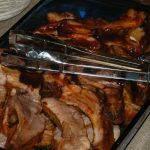 This recipe was originally meant for baby back ribs and the result was semi-tough ribs – like all of our other tries. There has to be a secret recipe out there somewhere for fall-off-the-bone spare ribs. This Memorial Day weekend (2011) I wanted to do something different than last year’s Memorial Day Memphis Style. I was inspired by a video on YouTube called “St Louis Spare Ribs” and the information I read on the BBQ Pit Boys website, Barbecue Web. 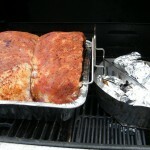 I started by buying 9 lbs (2 slabs) of spare ribs from the butcher on Friday before Memorial Day. I had them trim the ribs “St. Louis style” which means they cut off the “knuckles” or the gristly rib tips on the edge opposite the “baby back” cut. On Sunday, I started at 8 AM by trimming the flap of meat and fat off the meat side and removing the membrane on the bone side. I also cut each slabs in half. Then I spread on a thin layer of regular yellow mustard – the key ingredient to tangy St. Louis barbecue taste – and the rub. 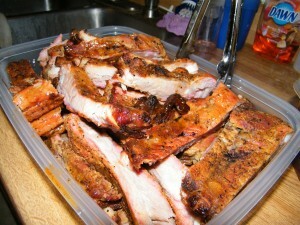 Then I put the ribs in the refrigerator at 9 AM to let them get happy for 3 hours. I planned on starting the low and slow cooking at 12 noon. I set up my grill with the left burner on low and a 13×10 drip pan on the right. I filled the pan with about 1/2 inch of apple juice, put the ribs in a rib stand, and put the rib stand into the pan. I added the rib stand this year because I thought the tilted grate method last year didn’t expose the ribs enough to the heat and moisture. This year I found the perfect sized pan, but the problem with the stand is that it’s too big to go into the pan the correct way – so that the ribs rest on the sides of the stand. So, I had to improvise and I put a strip of tin foil down the middle of the inverted stand and let the ribs drape over the strip. The key is 225°F for five to six hours. Open the lid sparingly (get it spare ribs, sparingly). As Meathead says, if the lid is open, you aint cooking. My grill isn’t the most consistent thing on the market and I admit I’m cheap when it comes to thermometers so I just use an oven thermometer. My grill will vary by as much as 50 degrees with less than a 1/4 inch turn of the dial. I have to check it every 1/2 hour to make sure it’s not too hot or too cool. I cooked the ribs for a total of 5 hours. I flipped the ribs in the stand at 2 hours in and 4 hours. In hour 4 I added some locally made, but pre-cooked, sausage. 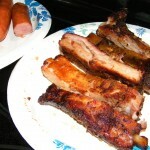 At 5 PM I took a knife to the ribs to test the tenderness – they weren’t tender. I took the ribs in and put them in a 350°F oven for 20 minutes. That didn’t help. They came out tough. All that work and money up in smoke, literally. I give up. No more ribs from me. On the flip side, the sausage was tough but good. The corn wasn’t quite what my wife was aiming for, but the pinto beans came out pretty good. This is going to be a social media experiment. 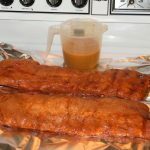 I want to share my experience as I cook ribs, and maybe get some feedback along the way. I’ll update this post along the way. 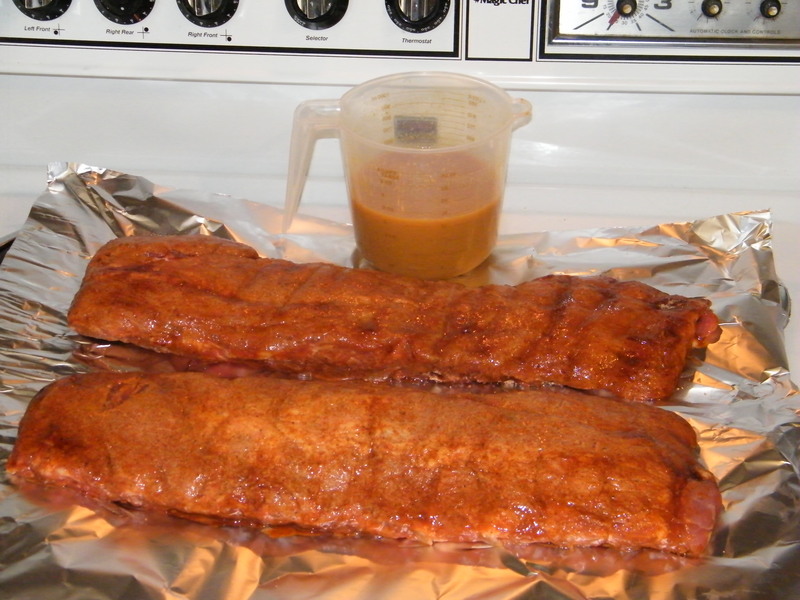 It’s Memorial Day weekend and I want to try a new rib rub, Meathead’s Memphis Dust Rub Recipe. I already made wet Memphis ribs back in February, but now it’s hot outside (95 F) and it’s a holiday weekend. Next to July 4th, I think Memorial Day is the best day to bbq. So, this time I’m going dry and rubbed; sauce will be on the table. Now, what sides? On Friday, I asked my wife if she would make potato salad. She wanted to make a pasta salad recipe that she found online. I thought maybe a 3-bean salad or corn or baked beans would make a good side dish. That’s how our ‘chat’ online usually goes: we throw out a bunch of ideas and pick one. Well, this time we picked them all. Saturday we went to the store and bought beans for the salad, corn, pasta, fresh parsley, fresh rosemary and a bunch of other things to make all but the baked beans. Oh yeah, I also bought a big disposable roasting pan. I suggest that you get a slab of ribs and put it in the pan to see if it fits. I made that mistake with the brisket last year. I also bought mesquite chips and a small disposable pan to put them in. Saturday night while I was preparing the ribs, she was busy making 3-bean salad and pasta salad – from scratch! She was cutting herbs, cooking pasta and beans and bacon, mixing, tasting – hum. That was so time consuming and exhausting that the potato salad would have to wait until Sunday. My rib rub was a little different from the Memphis Dust ingredients. First, I couldn’t find ginger powder or rosemary powder and I didn’t feel like making them myself. I added about 1 tablespoon ground cumin instead. Second, 1/2 cup paprika is a lot! I ran out at 1/4 cup so that’s all I used. The final rub was plenty spicy so I left out cayenne. I sprinkled the rub on the meat side of the ribs, wrapped them up in plastic-wrap, and put them in the refrigerator to marinate overnight. I have a three-burner gas grill so indirect cooking isn’t too hard. I just turn on the left burner and place the pan on the right side of the grill. It is important to let the grill heat up and stabilize between 220 and 250 degrees Fahrenheit. I poured about 1 quart of apple juice into the roasting pan, placed it on the right side of the grill, and heated the grill until it stabilized at about 220 degrees. As you can see from the picture, the pan was a little too big for grill and I had to shape it a little to get it to fit. Every few hours I would check the apple juice level and added more mesquite chips. You don’t want to open the lid too much because it lowers temperature and lets out all of the smokey, steamy, apple goodness. I think it took about 5 hours for my ribs to finish cooking. It was hot outside that day – at least 95 degrees. I tried to make a video, but I don’t like it too much. asta salad was still good (after more ranch dressing). As for the social media part, well, there wasn’t any. I guess I don’t have a big enough following because no one tweeted any suggestions. No one posted on my facebook wall how long to cook ribs or what temperature. And my video only got about 70 views in 1 year, and I was probably half of those. 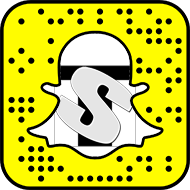 As for take aways I’d say if you want social media interaction for anything you need keep a lot of people interested. You also need to put out the word well in advance. I made a good rub. 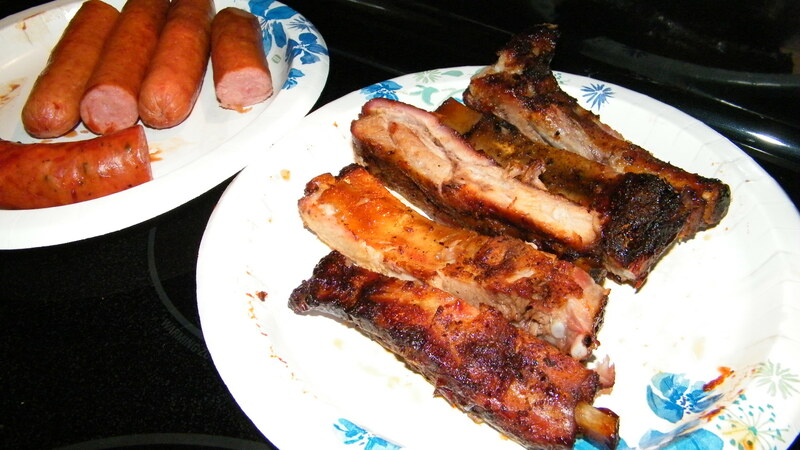 I cooked the ribs for enough time to make them tender. Next time I either need a bigger grill or smaller ribs and pan. In my defense I offer two arguments: 1) it has been about 8 months since I made brisket, 2) tomorrow is the Super Bowl and (2.5) we had good weather today. I wanted some ribs so I found a recipe from Marlboro of all places and decided what the heck. There is something you need to know about BBQ: all barbecue is not the same. And for god’s sakes don’t slap some barbecue sauce made in New Jersey on a rack of ribs and call it barbecue. I didn’t learn about barbecue styles until I came to Texas, but apparently there are 4 styles in the US. Memphis style comes wet or dry. The wet is mopped with a mustard and vinegar sauce while cooking. The dry is made with a rub and not mopped. Carolina style is rubbed and mopped with a vinegar sauce. Variants range from North to South Carolina. Kansas City style depends on the sauce. 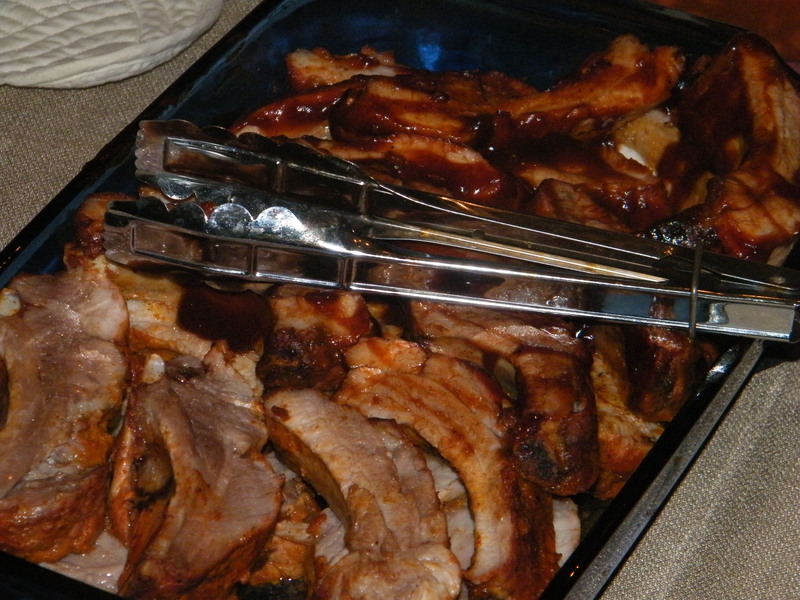 The rubbed meat is smoked and then served with sweet sauce at the table. Texas is so big it has 4 regions of it own. From experience I can say Texas style is cooked with a rub and then a tomato-based sauce at the table – if you really need sauce. In fact they will probably call you a Yankee if you sauce your bbq; it’s all about the rub in Texas. Well, I’m made wet and sloppy Memphis style ribs today. I rubbed them this morning and let them setup for 5 hours in the refrigerator. Then I made the mop sauce when I lit the gas grill. I setup the grill for indirect cooking as much as one can on a gas grill. For ribs its not really about the low and slow method. These ribs were supposed to cook within 2 hours. 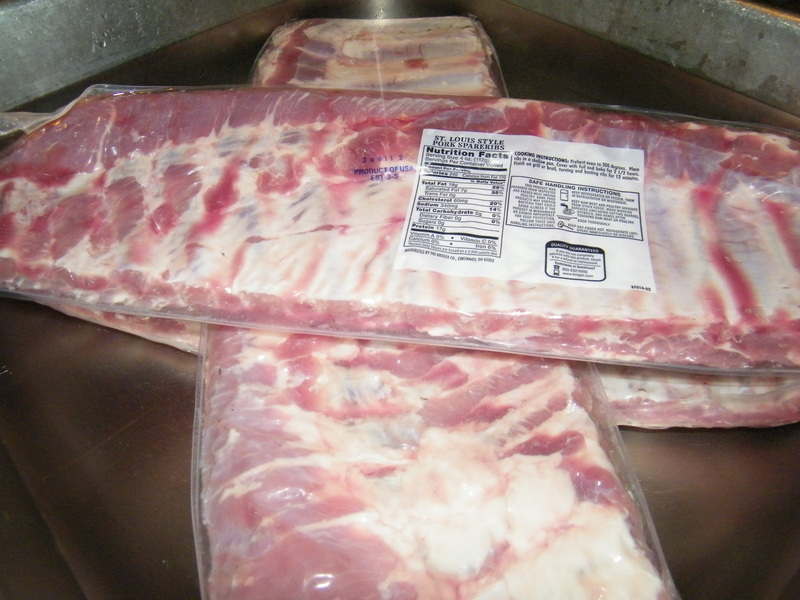 The secret to tender ribs is to pull off the membrane on the back. 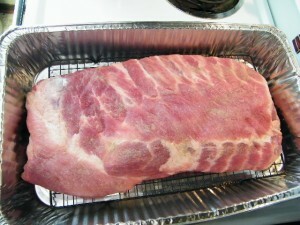 Make a cut parallel with the ribs in the membrane and insert the knife under the membrane and gently pull it up. Then pull the rest of the membrane up with your fingers. Combine the rub ingredients and rub about 2/3 on the ribs. Wrap in plastic-wrap and put in the refrigerator for at least 4 hours. When you wait for the grill to come to 200° F, combine the mop ingredients and set aside. Cook the ribs 1 hour meat-side up then mop the top and let cook for another 30 minutes. Flip them over and mop and let cook for 30 minutes. Continue mopping and cooking for 30 minutes until you run out of mop sauce or the ribs are done. Be sure to check the temperature. I try to keep mine at 200° F the whole time. 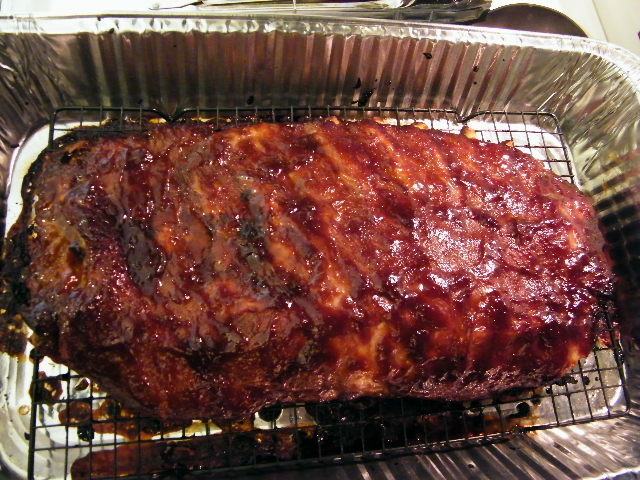 It took my ribs about 2 1/2 hours to cook. I served my ribs with baked potatoes and baked beans.